What will you do at The Real Halloween ? Don’t wait to ask the Wizards: have a good look round on these pages. 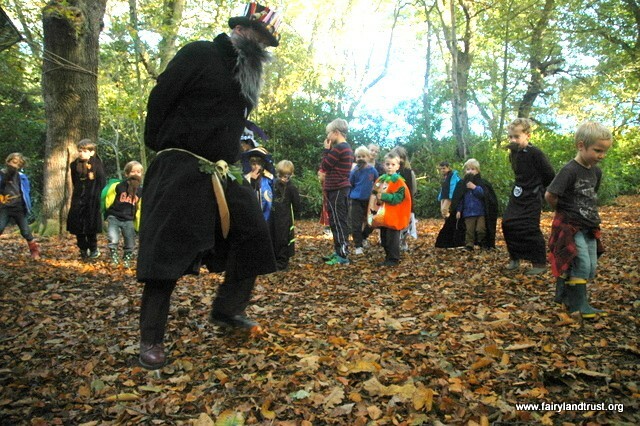 The Real Halloween brings you a bumper collection of ways for children to connect with nature in the Autumn. We have stories to fire the imagination, opportunities to play and discover things in the woods, magical things to make and enchanted characters to meet. 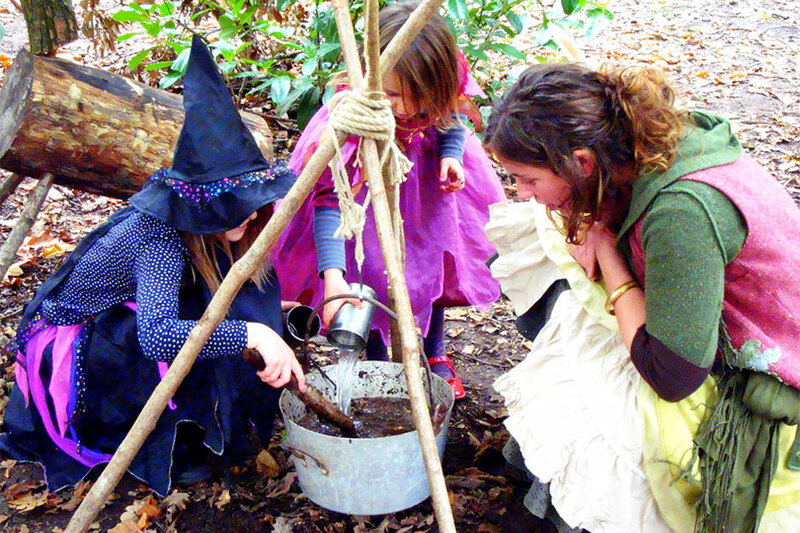 Last year we introduced the Magic Broomsticks bookable workshop, which proved very popular. Find it on the Side Lawn with the other bookable workshops (book online when you buy your entrance tickets). 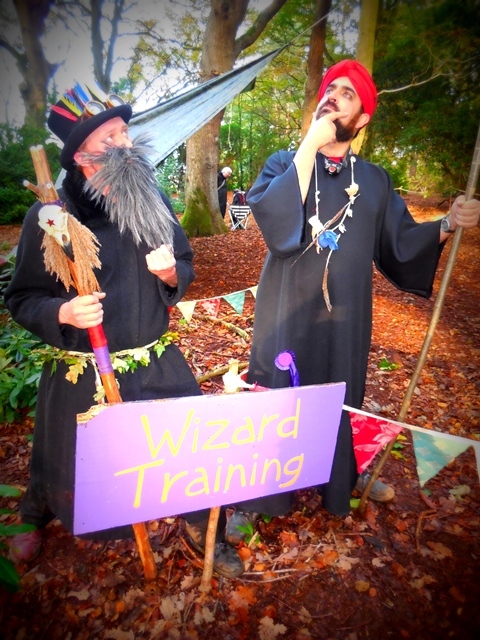 Learn the ways of magical birds, try on a beard and fill your Wizard Pouch under expert tuition in Wizard Training (bookable). Cook up a Witches Brew in Witches Kitchens (free). Explore for nature in Holt Hall’s ancient woodlands and follow the Rainbow Woodland Trail (self-led and free). In the woods you can also find Fairy Houses and Fairy Banquets (both free). What’s in this Fairy House ? Bookable Workshops (all £4 bookable in advance): Magic Wands, Magic Broomsticks, Witches Owls, Witch Training, and Wizard Training. How will your Magic Wand perform ? Trolls will also be out and about, magical commitments permitting. (Parents and carers should note that our Trolls are the very nice type and really rather scared of small children and especially fairies but do remember that meeting them shambling about in the woods or on the lawn is always a possibility and not something to be surprised about). Might a Troll live here ? The (cuddly) Wildlife Hospital is payable on the door and is on the Main Lawn (sessions at 12pm, 1pm, 2pm, 3pm), as is our drop-in workshop Bouncing Bats (selling bats which you can make on the spot and kits to take home). There too or nearby, you will find Jam Jar Lanterns, and Face Painting. The Lawn is also where you’ll find the more boisterous Halloween Games as well as the popular Photo Booth, and (free) all-day Story Telling, Musical Toadstools and Rimski’s Piano, plus (free) the Fire Boys and Girls. It all wraps up with the telling of “The Real Halloween” story in the Woods, followed by the Parade of Animal lanterns. These take place in the woods and are not suitable for under-3s or any buggies. Steep slopes and some mud are unavoidable on the Parade route, and everyone needs to be really very quiet to hear the story: please do not spoil it by talking during the story, or using mobile phones (select silent/flight mode or preferably turn them off). If you are making a Jam Jar Lantern to take to the Story or the Parade please do so early in the day to ensure you are not late. The Parade returns to the Main Lawn at the end and you can also stay there where the pub, stalls and cafe will remain open. If adults have stuff to talk about or children who might get bored at the story, please take some time out here instead where it is also warmer ! Details of the Real Halloween Story, Parade of Animal Lanterns, the Fire Show, Rimski and Trolls , along with story tellers, are under Line Up. Children may also enjoy some things found under Big Kids Activities such as the Woodland Trail and Face Painting. The rescue wildlife from Wild Touch (not a Fairyland Trust activity) can be found with the Craft Stalls. For full timings of activities including where charges apply, see the Programme. Overall event times Saturday 29th 12.30 pm – 6.30 pm and Sunday 30th October, 11.30 am – 5.30pm. See map.